Comfort, grip on and off the bike, build quality and good looks. That’s the bones of the list when it comes to flat pedal shoes, isn’t it? The Giro Jackets have spent a winter of testing bikes in Calderdale and this is how they’ve got on. The Jackets certainly are a good looking shoe. First box ticked. Rather than something with sleeves and a hood, the Jacket is actually a confusingly-named pair of flat-pedal specific shoes from Giro. Like the Chamber (Giro’s SPD version of the Jacket), it’s easy to see Giro’s design intentions, with significant influence drawn from the well recognised skate shoe genre. 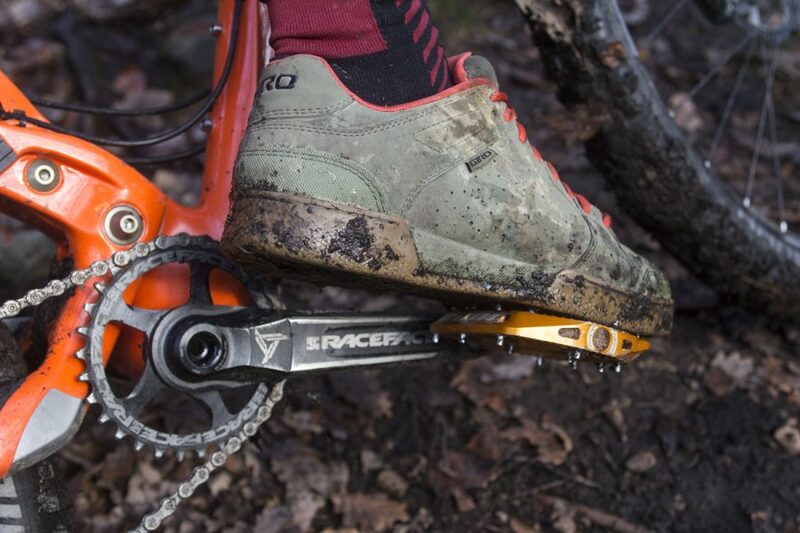 The end product being a shoe that is designed to make us look good both on and off the bike. And let’s be honest, I need all the help I can get. Clingy orange laces keep the Jackets nice and tight. The Jackets (according to Giro), “Transform the flat pedal riding experience“, and this claim is partly down to the Vibram Megagrip™ sole. 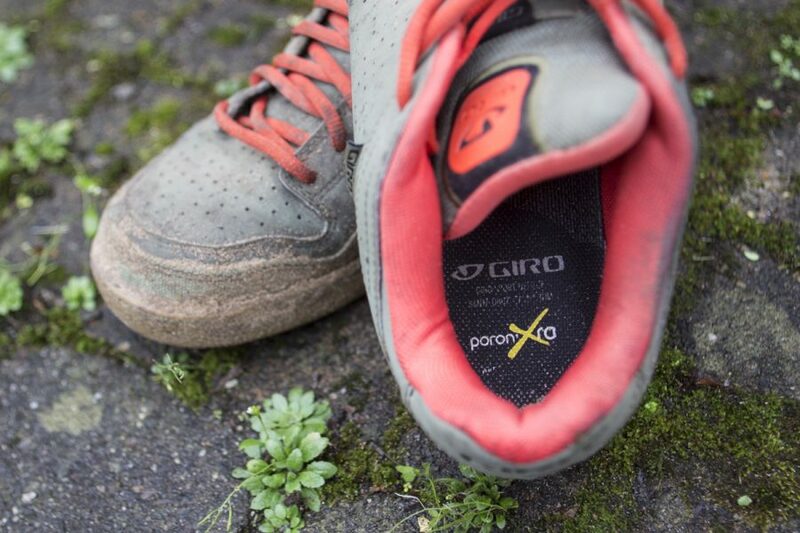 Giro claims the sole provides a high performance, sticky compound contact point between the shoe sole and pedal. 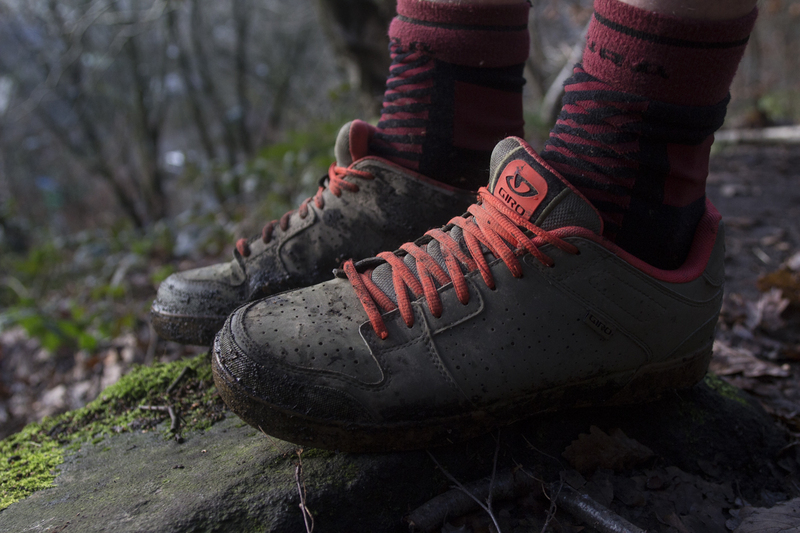 Plus, who doesn’t want a sole called Megagrip™? The ‘sticky’ compound soles on the underside of the Jackets. The upper part of the shoe doesn’t have an easy to find component material name, but (as previously mentioned) is said to be designed to be on trend with skate and downhill shoes. To the touch, it feels like a tough synthetic suede. The upper of the Jackets is well padded and supportive, which provides loads of comfort and heaps of stability for all-day pedalling. As for durability, after three months of riding and crashing, there aren’t any traces of scuff marks, tears or blemishes on either the upper or the soles of the Jackets. That leaves the ‘build quality’ box with a big fat tick. 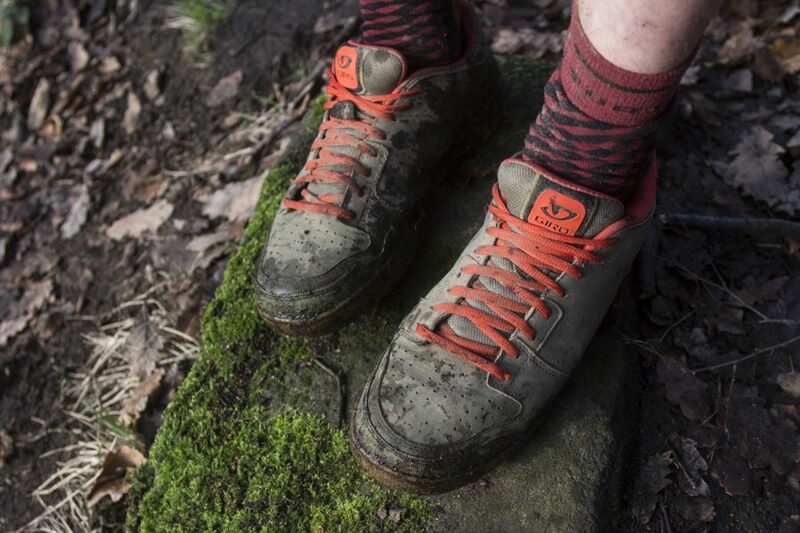 Super comfy uppers keep your feet warm and relatively dry. 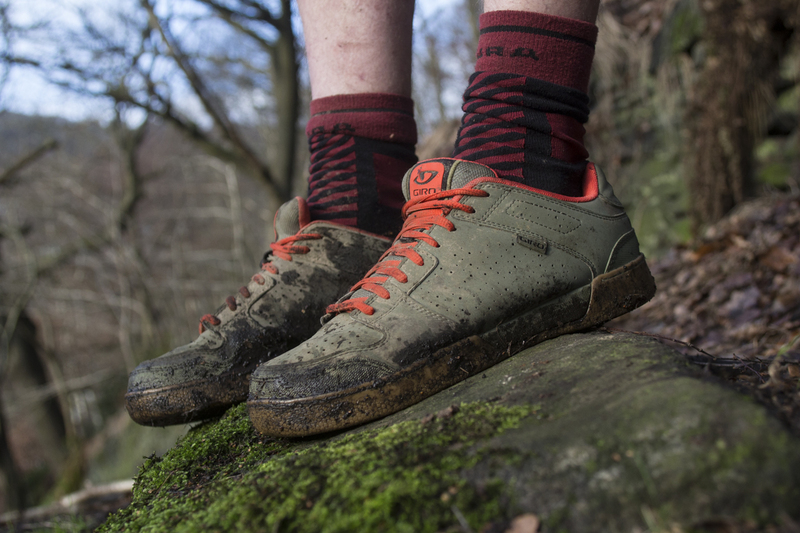 The Jackets are available in Black/Gum, Black/Turqoise, Dress Blue/Gum and, as tested, the Army/Glowing Red/Gum pair that’s now nice and muddy after a Christmas period in the Calderdale Valley. In terms of sizing, I’m usually a UK 11 or Euro 44-45 size depending on the brand. In the case of the Giro Jackets, and having tried on both a 44 and a 45, the size 45s seemed to fit better, being sufficiently snug but just enough wiggle room when on. Like most Giro shoes we’ve tested (including the Terraduro and the Alpineduro), width on the Jackets is middle of the road – they’re wider than a pair of Shimanos, but narrower than a set of Five Tens. Small sizing from Giro. My 11s fit in a 9.5 apparently. If you’ve been looking at purchasing a pair of Jackets, I’d still suggest going to try a pair on. This would be our advice with most ‘fitted’ wearable items such as shoes, helmets, or even gloves. If you’re set on ordering unseen, then I’d suggest bumping up half a size to be sure the shoes fit. The orange/red pops well, even in low light. Nice. Moving onto on the bike duties then. 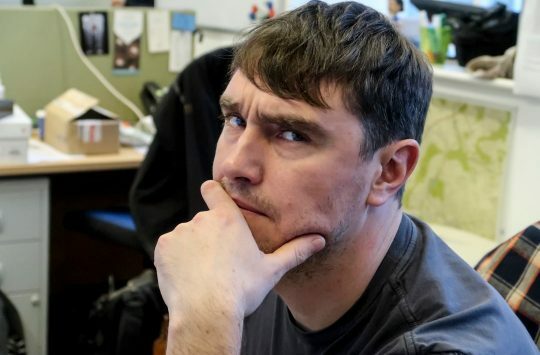 The good fitting nature of the Jackets make them incredibly comfortable when they’re on and the laces that come with the Jackets are very good. When you tie them tight, the laces seem to cling onto each other and lock together, meaning no flappy laces when you’re riding. The upper material isn’t specifically waterproof, but is definitely water resistant to splashes or a spot of light rain, which is a very handy feature, especially at this time of year. However, without a cover over the laces, water will find plenty of opportunities to sneak its way in if it really wants to. From that end, us cold weather riders would love to see Giro introduce a flat pedal version of the Terraduro Mid shoes, which use a large Velcro flap to shield the inside of the shoe from water ingress. Inside, the Jackets have something called a Poron® XRD™ heel cushioning. The point of this cushioning is to reduce the impacts you may get after a heavy landing, by up to 90% according to Giro. It’s a similar technology to that of D30, where until the impact happens, the material stays flexible and plyable, then when impact strikes, the molecules inside tighten up within the material, deflecting and absorbing the shocks when necessary. The Poron® XRD™ cushioning does work well. The Vibram sole is where my slight issues rise with these shoes. Vibram is a very well trusted brand and works well on a whole host of other shoes, but for some reason I cannot get on with the soles on these shoes. When on the bike, the soles are pretty stiff, which leads to difficulty in achieving consistent pedal placement when riding, even when trying a few different pairs of pedals. This is where some riders’ needs will differ from mine. 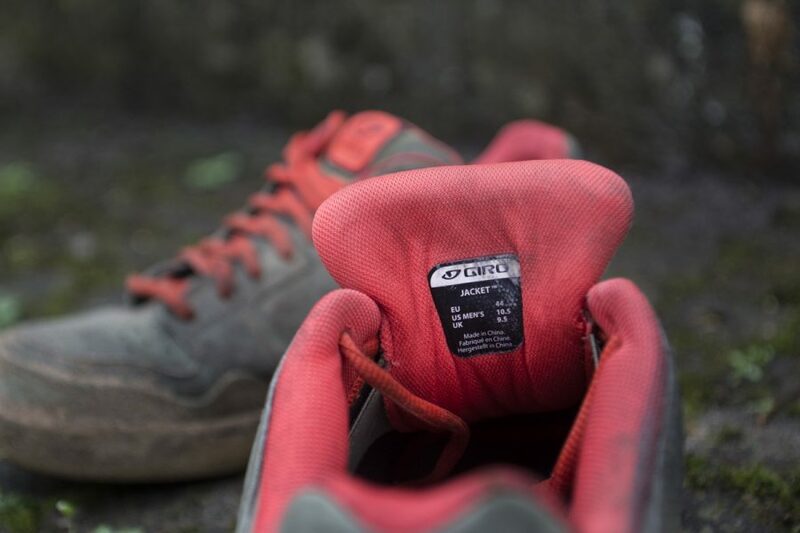 I prefer a certain degree of flex through my shoes in order to help me ‘feel’ the pedal body underneath, and the Jackets are simply too thick, and too stiff to provide that feel. For your reference, the Hope F20 and Nukeproof Horizon pedals are the ones I’ve been using most lately, along with a pair of less-grippy Stamp pedals from Crank Brothers. 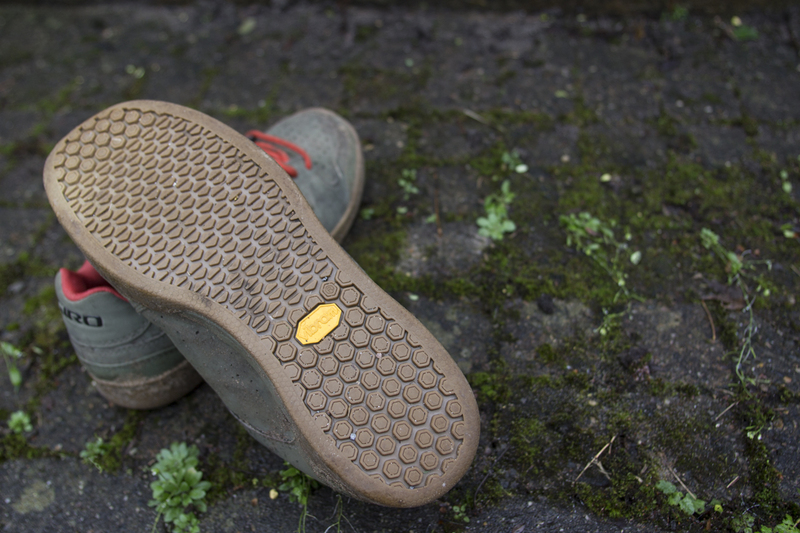 The stiff Vibram soles could be a slight downfall for the Jackets. 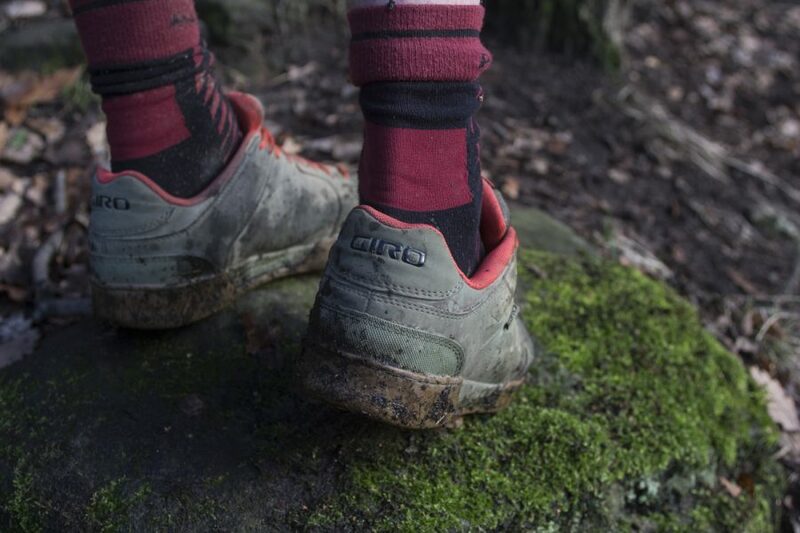 Compared to other popular flat pedal shoes such as the Vaude Moab and Five Ten Freerider, the Giro Jackets just don’t have the same level of traction on top of the pedal pins.The sole is split into two slightly different tread patterns, yet doesn’t give an awful lot of grippy surface area. 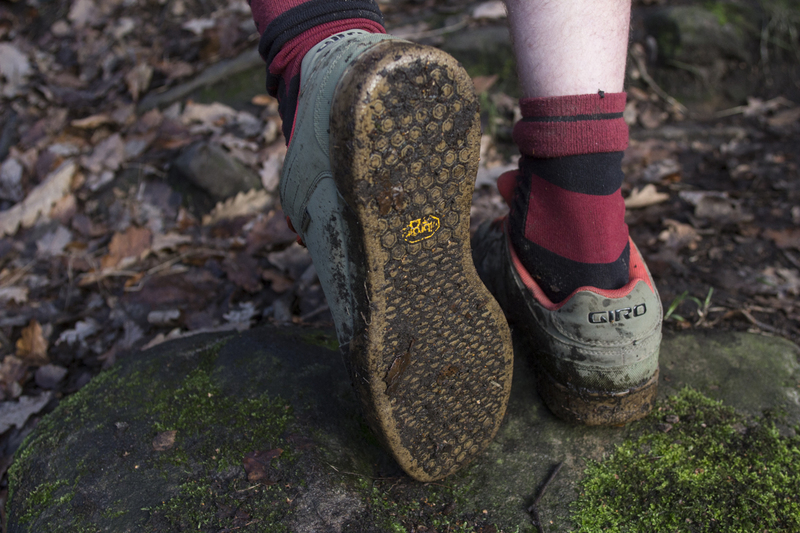 The gaps between the tread also feel rather small when you’re trying to get into position, meaning that the pins find it hard gripping onto the sections that are more openly accessible – even more so when they’re full of mud. These are shoes that have definitely been designed in dusty California. To achieve extra bite with the firmer Vibram rubber compound, you’ll want to adjust your pins out to their maximum height, or run additional pins if you can. 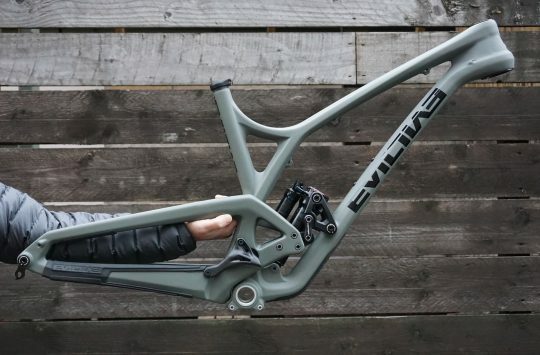 Regardless, the lack of stickiness is exacerbated by the stiffer and thicker sole on the Jackets, which establishes a rather vague connection between you and your bike. The flip side of this trait is that the Jackets are quite easy to move around on the pedal body while riding. And when the shoe is in position on the pedals, this stiffer sole does make light work of putting power down through the pedals. Push down and accelerate hard, and the Jackets feel solid as a rock. All clean after a New Years day walk on the beach. When off the bike, the soles still feel rather stiff and hard, meaning there’s little flex when you walk. This does make you more conscious of the way you walk, as you potter around carparks before you jump on the bike, or around the pub post-ride. On polished wooden floors, the Jackets do produce quite a clunk as you go. And despite three months of bike riding and office-wearing to try and break them in further, the Jackets haven’t lost any of their stiffness. The Giro Jackets are both a good looking and well-made flat pedal shoe. They’re highly comfortable to wear, and the lace-up design surprised me with how snug it stayed throughout each and every ride. However, the Vibram rubber sole isn’t as sticky as the competition, and combined with the stiffer sole, they aren’t ideal for riders who are chasing a soft and sticky rubber soled shoe. 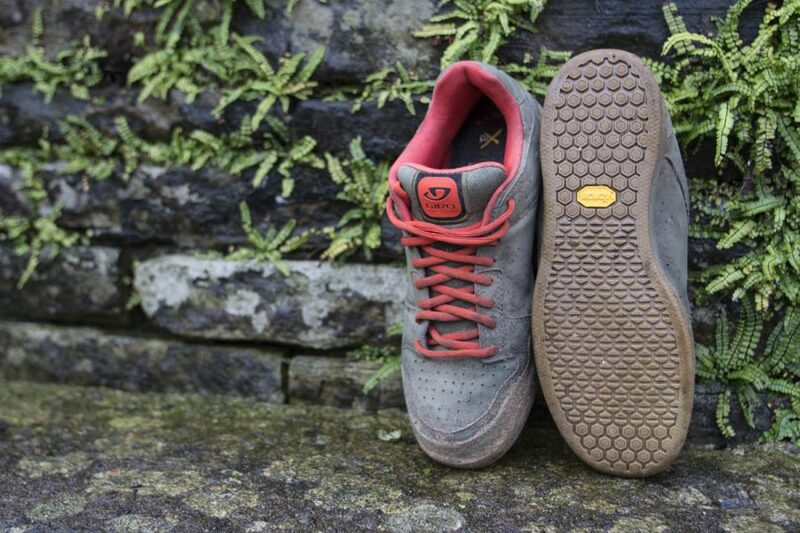 If you normally run actual skate shoes like Vans on your mountain bike, you really won’t be into these. 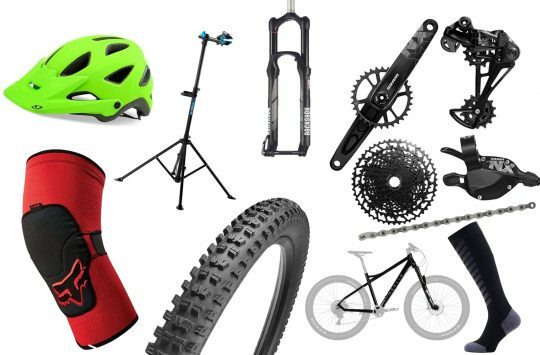 However, that same stiffness and stability will make them appealing to high-mileage pedallers who value a stiff and powerful platform between your foot and the pedal body. If you’re prepared to experiment with your pedal’s pin placement and height to get the most traction available, you’ll have yourself a comfortable pair of shoes that will climb and descend with you all day long. GoPro Karma Drone Re-Launching Soon?